An unaltered photocopy of your DD-214, OR WD AGO 53-55, OR other military issued document clearly displaying your Coast Guard Overseas Service Ribbon. 1. Active duty members of the Coast Guard on a permanent assignment and who successfully complete a tour of duty of at least 12 months at an overseas shore-based duty station or on-board a cutter permanently assigned to an overseas area. 2. Inactive duty members of the Coast Guard who are permanently assigned and have satisfactorily completed a minimum of 36 cumulative days of service at an overseas duty station during each 12 month period of the required tour length as established for active duty personnel. For eligibility purposes, two Inactive Duty for Training (IDT) periods equal one day of qualifying service (travel time does not count). 3. 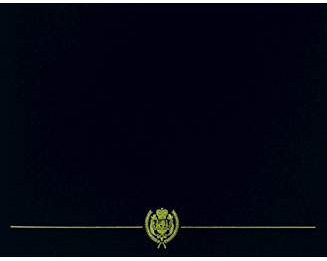 Reservists on exstended active duty must fulfill the active duty service requirements to be eligible for this ribbon. 4. Reservists mobilized and eligible for the Armed Forces Reserve Medal with "M" device are required to serve six months consecutive or 12 months cumulative at an overseas shore-based duty station or on-board a cutter permanently assigned overseas in an area receiving Imminent Danger Pay. "Overseas" is defined as duty outside the United States, including U.S. Territories, at shore-based commands and cutters permanently assigned overseas. Duty on board U.S. based deploying ships or units does not qualify. 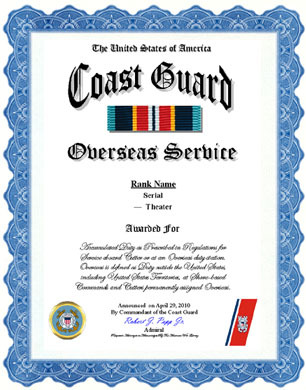 Personnel who receive or who are eligible to receive the Coast Guard Restricted Duty Ribbon (or an award for similar service from another branch of the armed forces) are not eligible to receive the Coast Guard Overseas Service Ribbon for the same period, and no waivers or exceptions are authorized. This ribbon may be awarded retroactively to personnel who are credited with completion of a tour of at least 12 months of overseas duty at a shore-based duty station. Individuals requesting awards for service prior to the approval date are eligible for the initial award only. The Overseas Service Ribbon is worn after the Coast Guard Restricted Duty Ribbon and before the Coast Guard Basic Training Honor Graduate Ribbon. This ribbon may not be worn on the Navy or Marine Corps uniforms. A bronze service star three-sixteenths of an inch in diameter is authorized for each subsequent award (a silver service star of the same size denotes a sixth award).